Ho-Ho-Holiday traveling – Keeping it Green! 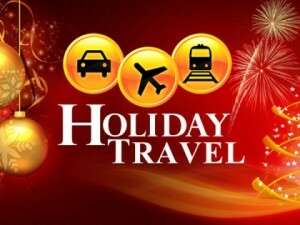 According to AAA, this year it is estimated that 40% of Americans will be traveling during the December Holiday period. While thinking about what gifts will be given may be on the minds of most people, we should also try to keep in mind what we leave behind during our travels. In the environmental world, this is called “carbon footprint“, or environmental pollution. While these actions may seem insignificant, if everyone does their part, it will help preserve energy and the enviroment. Turn off and disconnect all appliances. Items such as the coffee-maker, the hair dryer, the curling iron will continue to use electricity if they’re plugged in, even in the off position. Remember to turn off the TV and the lights before leaving the room as well. This cuts back on the electric usage significantly. Forgo the bath and take a quick shower instead! Taking a shower uses a lot less water than soaking in a tub. Plus, with the new high-powered shower heads found in many hotels, you get the added bonus of a water massage ! Reuse your towels and bedsheets as much as possible. Most hotels offer the option that leaving towels on the floor means you require fresh towels, but to hang them up means you will reuse them. The Alliance for Water Efficiency estimates that a 250-room hotel can save up to $66K and 220,000 gallons of water a year if guests choose to reuse their towels during their stay. Bring your own toiletries, such as shampoos, conditioners, and body lotions as much as possible. First of all, these will be better for you than the products placed in the bathroom. Secondly, it will reduce costs of having to replace these tiny little plastic containers on a daily basis. Some hotels have started using wall-mounted dispensers for these products such as liquid soaps, hair products, and lotions that can be used multiple times and reduce container waste. While the products may seem like great souvenirs, the memories of the great holiday will last much longer! And finally, recycle as much as possible! First, find out if your hotel has a recycling program. Most properties are starting to place containers and bins throughout the hotel, including in lobbies and in the ice-vending areas on each floor. Some properties will even place a small recycling bin in the room. Don’t send something to a landfill if it can be recycled into something useful again. So there you have some tips to keep the Holiday spirit and be green at the same time! Wishing you all a very Happy Holiday and best wishes for 2013!